1. Patented Atmospheric pressure non-sticky adhesive technology soft padding not sticky to human hands 2. Seamless fitment, light-weight design. Thinnest ipad cover in the market today. 3. Easy installation. Simply put it on the back of your ipad , apply a little pressure and it will stay on. 4. Can be reused unlimited number of times. washable and It will stay sticky for as long as you own it. 5. No adhesive residue like the glue-on case. No damage to the edge of your ipad like the clip-on case. High quality scratch resistances mat color finishing. 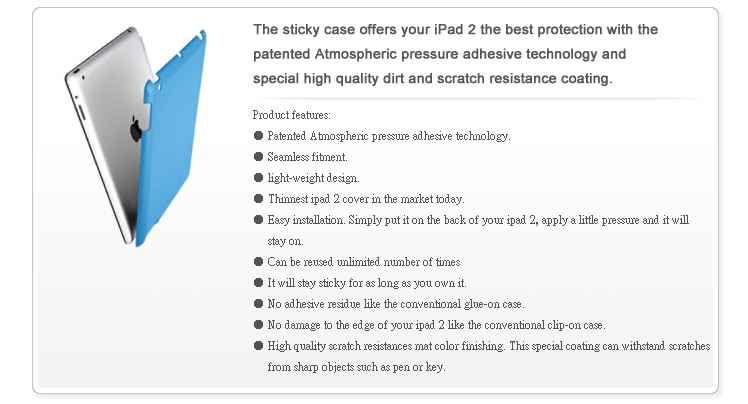 The sticky case offers your iPad 2 iPad 3 (The new iPad) the best protection with the patented Atmospheric pressure adhesive technology and special high quality dirt and scratch resistance coating. 1. Patented Atmospheric pressure adhesive technology. 4. Thinnest ipad 2 iPad 3 (The new iPad) cover in the market today. Easy installation. Simply put it on the back of your ipad 2 iPad 3 (The new iPad), apply a little pressure and it will stay on. 2. It will stay sticky for as long as you own it. No adhesive residue like the conventional glue-on case. No damage to the edge of your ipad 2 iPad 3 (The new iPad) like the conventional clip-on case. High quality scratch resistances mat color finishing. This special coating can withstand scratches from sharp objects such as pen or key. Works Perfectly along with ipad 2 iPad 3 (The new iPad) smart covers. Color matching, Seamless fitment, light weight and incredibly easy installation. The sticky case can be reused unlimited numbers of times without losing its stickiness. Works even better than the magnetic smart cover! Using the concept of Atmospheric pressure, once installed, the adhesive pad will be tightly stick on to ipad 2 iPad 3 (The new iPad) by squeezing out the excessive air between ipad 2 iPad 3 (The new iPad) and the sticky case. The longer it stays on, the tighter it gets. However It is sticky to the human hands or any other objects. The seamless stick-on design will not damage the edge of your ipad 2 iPad 3 (The new iPad) or leave any residue like the conventional clip-on or glue-on. It can be reused unlimited number of times. The light weight seamless fitment makes it one with your ipad 2 iPad 3 (The new iPad). Special designed high quality coating finishes makes the sticky case dirt and scratch resistance and can withstand scratches from sharp objects such as pen or keys. Available in many different colors for the unique you. The highest safety and quality control standards. It is also produced with green materials. 48hr at 176 degree Fahrenheit /80 degree Celsius/ Humidity 80% may be slightly heated; no Deformation or peel detected.